1. Why do you have SharePoint? Because everyone else has it? Because you got free licenses? Or do you have a proper business driver for requiring this type of platform? Can you answer this question? If not, it’s the first thing you need to do or the whole implementation will be an uphill battle. 2. What part of SharePoint have you got? Is SharePoint installed on your servers at your premises? If not, do you have servers and storage capacity to install it? Do you have the necessary server licensing, did you even know there was some? Have you been given free licenses for your users? What type of licenses do you have? SharePoint 2013, 2010 or 2007? Foundation, Standard or Enterprise? Or Office 365? (The current version is SharePoint 2013). Ask Microsoft if you aren’t sure. Do your research and make sure you have the right licenses for your needs. Contact Microsoft when in doubt. 3. Do you have the right technical competency inhouse? SharePoint is not like other software, don’t treat it as such. You need to set up and maintain servers, do SharePoint business analysis, compile training, governance and communication plans; carry out training and configure team sites for users, automate business processes. If you don’t have the skills, outsource all of this until you can learn it. It sounds expensive when you get the quotes, but long term it will save you money because it’s getting done right the first time. It’s much easier to build something from scratch than it is to troubleshoot and rebuild a total mess. 4. Will it be used for the intranet, extranet or internet? All these have long term technical and financial implications. Your planning has to be robust. Do you know the difference between Team Sites, Intranet Sites, My Sites and Publishing Sites? You need to know this before you start adding any content and giving people access. 5. Do you have Exco support for the project? 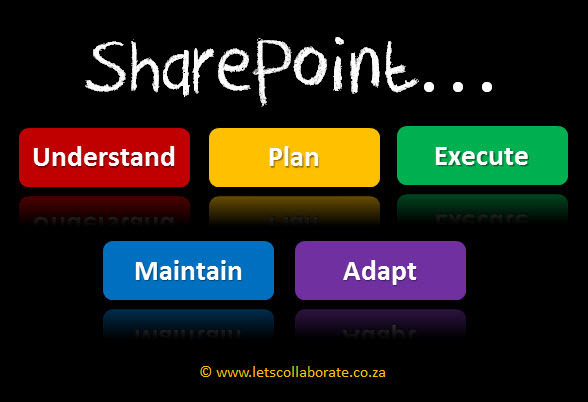 SharePoint is a huge change in culture – the way people work and think will be completely changed. It can as such be considered a disruptive technology in most organisations. It is also expensive, someone high up has to ok these issues. 6. Do you have budget for training, consulting, servers, storage, licenses, upgrades, custom development, etc etc etc? If not, go back to your planning phase and sort this out. Here is a great blog on budgeting for SharePoint. This platform has far reaching financial implications. Have you decided who’s paying for what? This alone can cause endless internal wars. 7. Do you have at least one dedicated SharePoint person? Do not make the mistake of thinking that SharePoint is a part time job. If there is no-one to consistently drive the platform into business and keep an eye on things, it will simply not happen. The size of the company and type of SharePoint you have will determine how many people you need, but minimum one full time is crucial. 8. Have you identified content owners in the business? You can’t do it all yourself. You need to build an internal competency of super users. Do they know they will be getting this extra work? Are you giving them the time to go on training and time to implement what they’ve learnt? 9. Do you understand how SharePoint permissions work? Do you know the difference between Site Members, Site Owners, Site Visitors, Site Collection Administrators and Server Admininstrators? Who is going to be in each of those categories and what are the rules for jumping around them? You also need to understand how access is granted on different levels on a site. 10. Have you done your homework on SharePoint vendors? Few companies have the inhouse skills to get SharePoint right the first time, so consultants are usually called in. Make sure you Google everything before you sign on the bottom line, and get traceable references. Word of mouth is a great tool here, phone around and see what people are saying first. This is a good start. Answering these will take you on the journey to answering the countless others that will come up. And remember, SharePoint is not just a document management system, it can do so much more than that. But starting there is a good a place as any. Getting your business up and running on SharePoint is a process. It will take time for everyone to get up to speed with how the platform should be used. Hiring a consultant is recommended. Thanks for Sharing good list of questions. Organizations who want to choose the SharePoint because many of them will try to use the product because some one else is using it or suggested by guys at management level. SharePoint has lot of capabilities that can really improves the productivity of organizations. Great post as ever. You could use PartnerPulse.co to find a good partner. The site is a community of Microsoft partners, a great place to find a name and contact details.